Curve balls get thrown often in life. Over a week ago, I told myself that I wanted to do a post about pseudoephedrine. You see, Nevada lawmakers have been considering making changes to how you can acquire products containing the decongestant placing it squarely in the hands of physicians. Currently, there are already Federal Laws that limit purchasing the items (daily sales not to exceed 3.6 grams without regard to the number of transactions or monthly sales not to exceed 9 grams in regulated products.) Many manufacturers have "reformulated" in an effort appease but the effectiveness of the substitutes can be questioned. Of course, this is all being done to cut down and fight methamphetamine use. I planned to talk to talk about how this hits the little-man in the pocketbook with an extra co-pay just to get something for influenza or a cold. I wanted to denounce the lobbying by those in the medical field had to have done to push that through. I can honestly say that every pharmacist that I've asked, "What works best?," told me that the items with the drug were better by far. Then I got sick on Sunday. Tried to make it through work on Monday but left halfway through my shift. I went straight to Walgreens and picked up Advil Cold & Sinus which was recommended to me as well as some cough medicine and cough drops. I went home and slept. I spent all of Tuesday in bed. That night and the following day were tough as was sore, had the chills and couldn't sleep longer than 30 minutes at a time. At 6 a.m. this morning, I gave in and drove to the Quick Care near the house... they open at 8, so instead of being suspicious sleeping in my car in the parking lot, I went home. Killed off a can of soup, took a hot shower and got back in the covers. Finally pushed myself to go back at 3:30 p.m. It's bronchitis. The doctor said that it was pretty bad and gave me 4 prescriptions to fill... one was for Pseudovent (pseudoephedrine/guaifenesin.) I'll be better soon but I keep thinking that it sure would have saved me 48 hours and +$30 in "over-the-counter" medicine if I had just gone to see the doctor in the first place. So, in my recent experience, I'd say that making pseudoephedrine-based products a prescribed medicine would have saved on lost productivity, restlessness and coughing. But, not everyone has insurance. Not everyone can pay an extra co-pay on top of the price of their medicine. I am all for monitoring the use of these drugs at pharmacies. The Advil that I purchased had 20 tablets in there. Individually, they have 30 milligrams of pseudophedrine (recommended dosage of 1 to a maximum of 2 tablets.) I'm not going to do the math for you (1 gram = 1,000 milligrams) but if you are using nearly 3.6 grams of it per day... you are probably a meth addict. I'd be more apt to believe a uniform box that contains enough for a two week supply (as it's probably more serious if it lasts longer than that) is a great idea if one is allowed to purchase a box per month. Then again, maybe if they had a little machine (like the one that checks blood pressure) that will hear the rumble in your lungs, it would steer me away from purchasing the box and seeing a doctor. 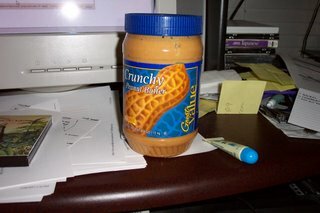 The recent warning about Salmonella contamination in certain brands of peanut butter got me thinking recently. You see, when my recent house guest (who charged up $6,000 in credit card bills and new credit card accounts) didn't eat much. She believed that she was a 'born again' vegetarian. I had no problem with that. I remember asking her if there was anything she wanted from the store that would make things easier. Peanut butter, crackers, tampons and beef sticks (yes, I probably had the same reaction to the final two as you are now.) I picked up the items and went about business as usual. So, months later, I see that report and I decide to check on the peanut butter... the number on is starts with the "2111" number series we were warned about. Maybe there is some divine justice out there although I do hope that she is alright. Does make me feel a little better as I'm still dealing with the credit card company. Every so often I like to talk about software. Why? Well, I think that if there is something free out there that can replace and often surpass the quality of a product you would pay for... you should know. Years ago, I would have told you that having Norton System Works was a great package. It had a defragmenter envied by Microsoft (until XP came out), one of the best disc repair programs (early versions of Windows actually told you to run their Disc Doctor by name) and their antivirus program. Well, Norton Antivirus has been losing standing in my eyes by letting several things through that were easily caught with other programs. It also has slid down in ratings by Consumer Reports. Oddly enough, there was this IObit program that popped up in the listing. There is a pretty good explanation of it in this press release. Now, this isn't an antivirus program (I changed over to Avast! last year.) But what I find interesting is that several of these programs don't like each other. I only started looking at IObit after Avast! mentioned a conflict with Norton. And of course, I'd rather not pay $20 a year just so my antivirus program catches the latest problems when I could just spend it on a CD. I have found it amazing the amount of problems that have been fixed by changing programs and even installing it on other computers. It happens every once in awhile. Someone says something that makes a lot of sense and you now see the path ahead going in two directions. I'm standing at the fork of this road. The statement came from someone involved in the radio business talking about his podcast. He mentioned that the smartest thing that he did was set up internships at the local college offering a small percentage of revenue from the podcast. If I am correct, there were two getting 5% each. One position would run public relations and the other would do advertising/sales. 5% or even 10% of little profit is little pay so they would have to work hard to create revenue. You see, it'll soon be about a decade since starting the newsletter (in its most primitive form.) And for all the visitors the site gets, I've done no advertising or promotion. This is the same with the podcast which generates listeners via cross-promotion from the Web site and newsletter. (Which means... pretty much the same people getting hit with the same ideas.) Why no advertising or self-promotion? People don't trust people that have to toot their own horn. I wouldn't. If I wanted to promote things, I'd have to pretend to be someone else when writing. Don't laugh. I actually have two friends listed as being in charge of sales and advertising on the Web site with their email coming to one of those multiple email accounts that I told you about before. I'd usually respond back to inquiries by saying, "Daniel (or Dion) forwarded me your inquiry." Doing that doesn't sit well with me. I'm actually shocked that I was able to arrange some great interviews by sending off a few messages at MySpace but how much better would it be if someone else did it representing you? If I had someone planning a minimum of 26 interviews a year (every other week gives me a breather,) I could focus on preparing questions and content. News of that interview that week would be sent to people running fan Web sites. So, I'm at that divide. Sure, I would have to do a little more work to create internships, manage income and increase my organizational skills to grow something I enjoy into something much larger. But, 5% or 10% of nothing is nothing, so there is little loss other than complete control. Sounds like a winning situation. But, there is that fear of getting too business-like. There is the fear that more and more time will be needed when it should be lessening the workload. I could take that other path of least resistance -- doing what I've been doing -- but my original idea of starting all this was to get information that was being bypassed by the major media outlets to the fans. I could reach more with better promotion. The only thing that I can do is put my toe in the water to see if it's cold or not. Maybe soon.